WASHINGTON, D.C. -- Given a choice, 54% of rank-and-file Democrats and Democratic-leaning independents would prefer that their party move closer to the center, and 41% would rather it shift further left. At the same time, rank-and-file Republicans and Republican-leaning independents favor a shift to the right for their party, as 57% say they would prefer it to be more conservative, and 37% say more moderate. These findings come from a poll conducted Nov. 13-18, after this year's midterm elections, that offered two answer choices to each party's loyalists. Gallup asked this question just once before and only about the Democratic Party -- in January 2005, after George W. Bush fended off John Kerry's presidential challenge. At that time, a slightly higher 59% of Democrats favored a more moderate shift, while 35% called for a more liberal party. Yet, the Democratic Party's rank-and-file did indeed become increasingly likely to identify as liberal after 2005. Over the past two decades, the Democratic Party has become less ideologically mixed and was decidedly left-leaning in Gallup's 2017 yearly average, with 50% of Democrats identifying as liberal, 35% as moderate and 13% as conservative. For their part, Republicans have been much more stable than Democrats in their ideological characterizations of themselves over the past two decades, with most saying they are conservative. Over the past decade, conservative identification among Republicans has been at roughly 70% and only slightly below that level before then. Partisans' own ideology is the most striking demographic difference when one looks at their ideological preferences for their parties. Although these findings are perhaps intuitive, those who identify with a particular ideology would like their party to reflect that philosophy. 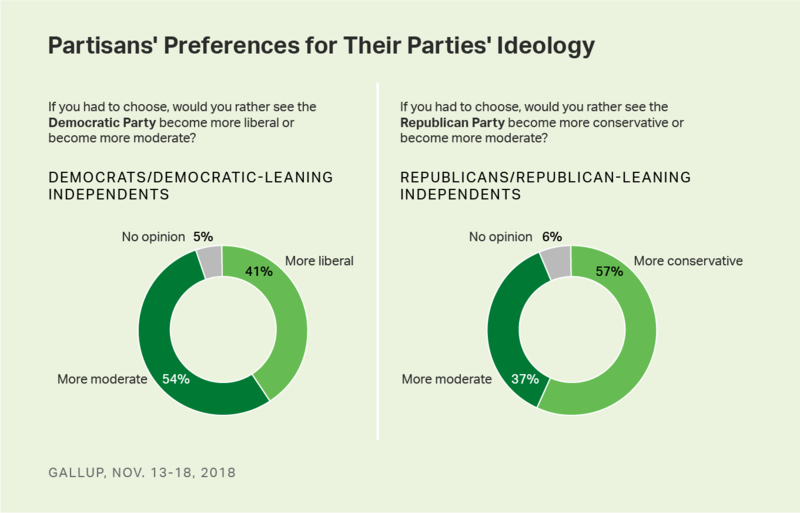 Thus, 69% of liberal Democrats prefer that the Democratic Party become more liberal and 73% of moderate and conservative Democrats favor it becoming more moderate. If you had to choose, would you rather see the Democratic Party become more liberal or become more moderate? Likewise, 77% of conservative Republicans favor a more conservative party, while 68% of moderate and liberal Republicans prefer a more moderate party. If you had to choose, would you rather see the Republican Party become more conservative or become more moderate? As the country has become increasingly polarized politically, Democrats have become more likely to describe their political views as liberal, while most Republicans continue to think of themselves as conservative. A majority of Democrats favor a shift toward the middle, while Republicans prefer a more conservative shift for their party. The progressive wing of the Democratic Party that aligns with Bernie Sanders has become increasingly vocal and had some electoral success in the past year but had mixed results in the 2018 elections. Looking ahead to the 2020 presidential campaign, Democrats overall may think that a move to the center might make their party's presidential candidate more electable. 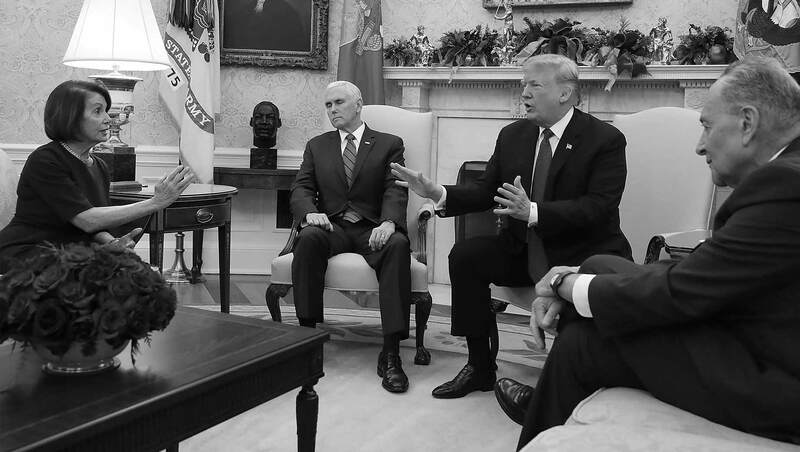 At the same time, Republicans may be thinking that doubling down on a more conservative approach would be a winning strategy if voters perceive the opposition party as moving to the left. Ultimately, the ideology of each party's presidential nominee will offer insight into the direction in which partisans would like to see their parties move.